For the billionth time, I'm going to say I love my wedding shoes. Bear my vanity for a second! 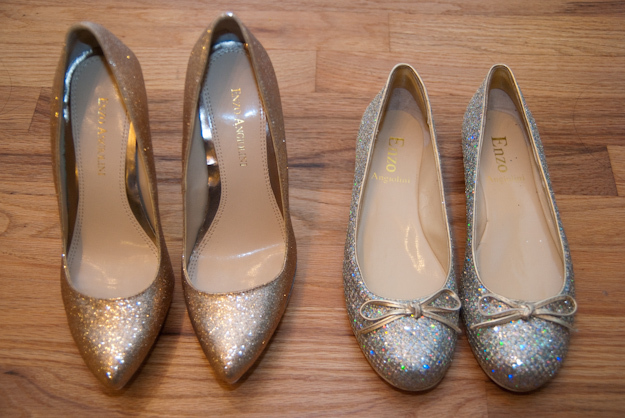 One is a pair of 4-1/4" pointy gold glitter pumps from which I'm STILL recovering blisters. Of all the gold heels I searched for, for months, I found these to be the best--simple and classy in form, and "bling" with none of the tackiness of many other gold/glitter shoes. 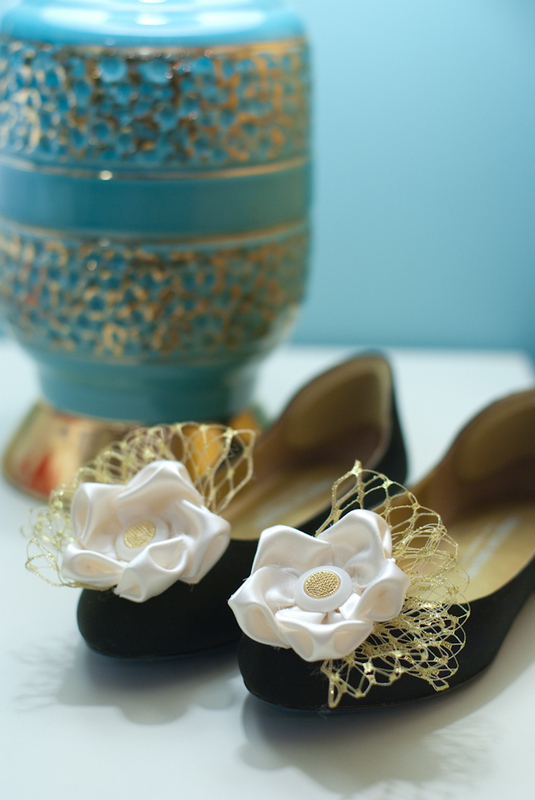 You can find gold glitter shoes by about a hundred other brands (even Target now! ), but this pair is the queen of them all. And I was SO LUCKY to get them in size 5-1/2!!! Imagine that. I hate all you shoe makers who only make shoes size 6 and up. Sadly, or not, these shoes cost way less now than for what I originally bought them. I guess that's just how it goes. Second is a pair of the same Enzo Angiolini line. An uncommon combo of rainbowy glitter and gold flats. I almost bought these for about a hundred bucks. That's how much I liked them. I rarely ever, ever buy shoes that go three digits, let alone a pair of flats. But in a stroke of luck, I saw them at a DSW for a fraction of the price. I'm a fan of DSW now. Who cares about what season is in or what is in season. My last pair of regular flats pretty much got destroyed in the mud and rain during my "bachelorette". And I would wear the glitter flats from now on for forever and ever. But they won't last forever and ever...and wearing them out to go get gas or the market is such a waste. I need something else! Good, inexpensive flats are pretty hard to find. But it doesn't make sense to me that a nice pair with some simple little bows on top can cost so much either. Maybe I'm just too picky. How about I put on those little bows myself? 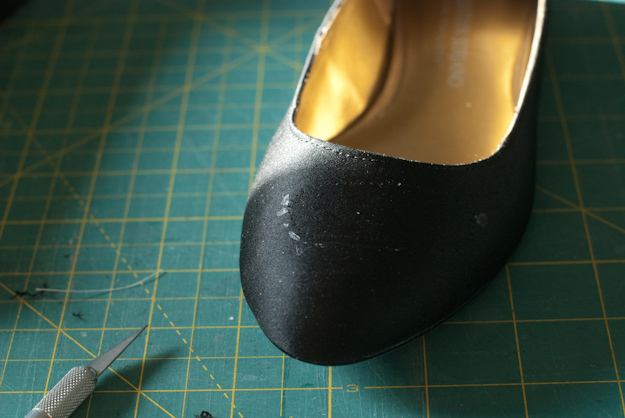 A properly shaped flat is what makes a good flat. A flat or overly round toe makes you look like you're wearing toddlers shoes. I saw these Christian Siriano for Payless that had a pretty interesting form to them. For $16. But those ribbons...are sooo ugly and poorly constructed. I think the ideas of Christian's shoes are great, but the quality of the materials and handiwork totally downgrade the shoes. And so, I ripped them out. 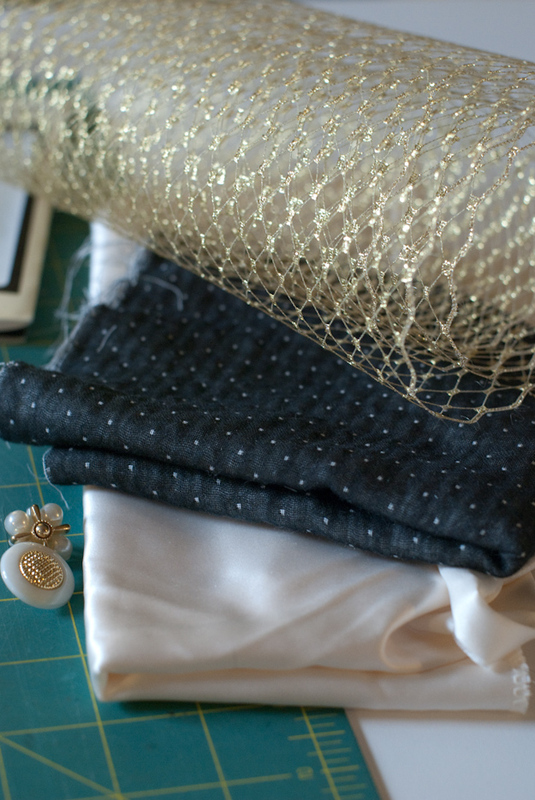 I really love the pure silk fabric from my wedding dress and the gold netting from my veil, so I wanted to use the leftover scraps from these somehow. I also wanted a way to remember these great textures and colors, even after putting the dress and stuff away for storage. So I guess having them on some shoes isn't such a bad idea! What a lovely combination of materials. And here's the outcome. I'm not totally sure how I feel about the netting yet. I like having it, but I'm uncertain about its usage. I'll probably just wear it out a few times and see how I feel about it. But hey, for $16, there's nothing to be afraid of with just messing around with it!